Questions? Comments? Concerns? Please reach out via email at alumni ‘at’ stanforddaily.com. 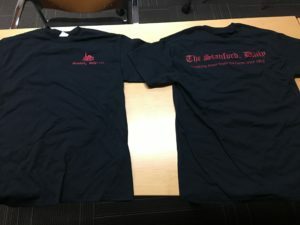 You can help us in our mission as a 501(c)(3) nonprofit of educating a new generation of Stanford students in journalism, digital media, and business with your generous contributions. All donations are tax-deductible. 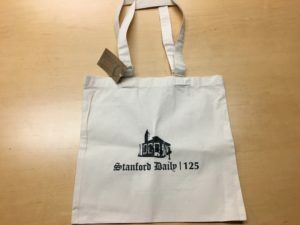 As we mentioned at Daily@125, we’re looking for volunteers to help organize The Stanford Daily’s growing alumni network and The Daily’s upcoming Capital Campaign. 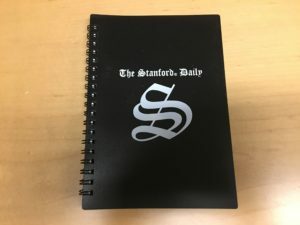 If you have any interest in helping organize alumni or providing mentorship or career opportunities for current Daily staffers, please indicate your interest by emailing us at alumni ‘at’ stanforddaily.com. We also learned through the event that many of your beloved Daily colleagues are not signed up for our newsletters. 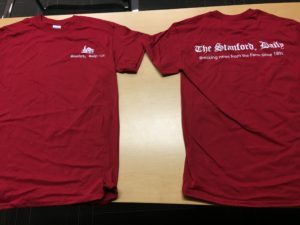 If there’s anybody you know that hasn’t been getting communications from us but would like to be added to our mailing list, please give us their contact information at alumni ‘at’ stanforddaily.com. Many thanks to everybody who was able to join us for our Daily@125 event on November 17! It was our honor to host several generations of the Daily family in a celebration of the 125 years that our publication and its people have impacted the Stanford community. If you weren’t able to make the event, embedded below are videos from the event. The first video contains Opening Remarks, EIC report (Ada Statler ’18), Keynote #1 (Joel Stein ’93), the two Daily-centric panels (“The​ ​Daily​ ​and​ ​journalism:​ ​Then and now”​ ​and​ ​”The​ ​Daily​ ​and​ ​sports​ ​media:​ ​Then​ ​and​ ​now”), The State of The Daily (Do-Hyoung Park ’16), Keynote #2 (Douglas Wilson ’72), A Call to Alumni (Tim Marklein ’91), and Closing Remarks. Featured panelists: James​ ​Hohmann​ ​’09,​ ​Marianne​ ​LeVine​ ​’13,​ ​Art​ ​Streiber​ ​’84,​ ​Philip​ ​Taubman​ ​’70, Ivan​ ​Maisel​ ​’81,​ ​Ramona​ ​Shelburne​ ​’01,​ ​Susan​ ​Slusser​ ​’88,​ ​Tom​ Taylor​ ​Ph.D.​ ​’13, Douglas Wilson ’72. The second video contains the first part of “The ​business​ ​of​ ​journalism:​ ​Navigating​ ​an​ ​uncertain​ ​future” panel (the second part of the panel can viewed immediately following the conclusion of Part 1). Featured panelists: Peter​ ​Bhatia​ ​’75,​ ​Tim​ ​Grieve​ ​’86,​ ​Jay​ ​Hamilton,​ ​John​ ​Kosner​ ​’82. The third video contains the first part of the “Technology​ ​in​ ​journalism:​ ​An​ ​evolving​ ​toolkit” panel (the second part of the panel can viewed immediately following the conclusion of Part 1). Featured panelists: Ann​ ​Grimes,​ ​Josh​ ​Haner​ ​’02,​ ​Nicholas​ ​Thompson​ ​’97. 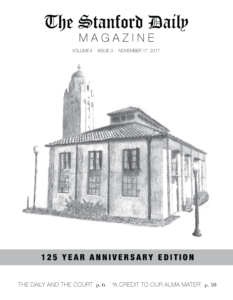 As a companion piece to our Daily@125 event, our editorial staff produced a special 125th Anniversary edition of The Stanford Daily Magazine, with content focusing around the history of The Daily and its relationship with Stanford University, and the people — both past and present — that have helped to build this institution into what it is today. You can read the digital edition of the magazine here, and you can also purchase a physical copy to be a part of this special anniversary of The Daily! You may leave The Daily, but The Daily never really leaves you — and what better way to fulfill that by purchasing some Daily-themed merchandise. Purchases can be made via PayPal, at the link included above under the “Support Us” header (please indicate your purchases in the “special instructions” part of the form).